There is a great career opportunity for these who are looking for School Jobs as a teacher, because RPSC introduce an official notification in which they are inviting all Indian candidates to apply for this RPSC Recruitment process 2018. There are approximately 8100+ Teacher Vacancy which are going to fill up under these School Jobs in Rajasthan State of India. All Indian candidates who meet with the educational criteria as well as other criteria which we explained below in the same post can apply for these School jobs in India. Through this RPSC Recruitment process 2018, department is going to fill up the vacant posts of teachers in various school throughout the Rajasthan State of India. There will be an entrance exam conduct by RPSC Recruitment department for the selection of candidates under these school jobs in India. Detailed information related to this RPSC Vacancy is given below in this post, read the whole eligibility criteria carefully below before applying for these Government jobs in Rajasthan State. For English, Maths, Urdu, Hindi, Sindhi, Sanskrit & Punjabi Teacher: Those who have passed in their graduation with concerned subject as Optional Subject. Candidates must have a Degree or Diploma in Education recognized by National Council for Teacher Education. For Science Teacher Must have following qualification: A Graduate applicants from India having at least two of the following subjects as Optional Subjects: Physics, Chemistry, Zoology, Botany, Micro Biology, Bio Technology and Bio Chemistry and Degree or Diploma in Education recognized by National Council for Teacher Education. 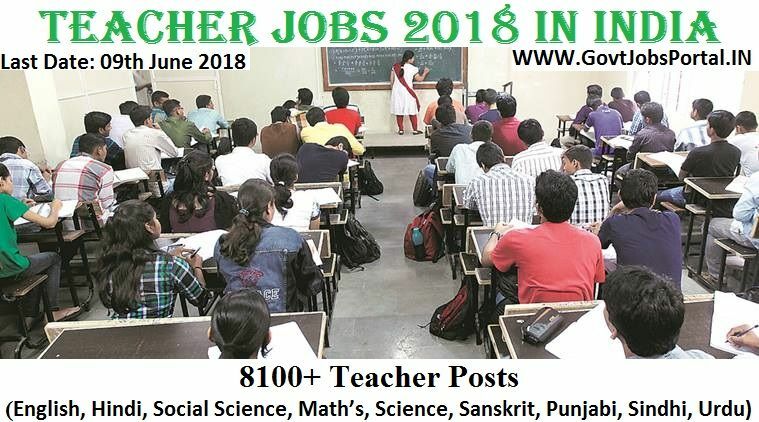 For Social Science Teacher: Indian Graduate having at least two following subjects out of the subjects – History, Geography, Economics, Political Science, Sociology, Public Administration and Philosophy as optional subjects. Candidates must also have a Degree or Diploma in education recognized by Government of Rajasthan. Age Bond: Applicants whose age in between 18 years to 40 years can apply for these School jobs under this RPSC Recruitment 2018. After matching with the all above eligibility criteria above the question which came in our mind is “what is the application fee for applying these School jobs? The answer is all follow:“Applicants belonging to the General category, BC(Creamy Layer) have to pay Rs.350 as their application fee, While for NON Creamy layer BC and Special BC candidates of Rajasthan have to pay Rs.250. Applicants belonging to the SC/ST/PH category have to pay Rs.150 as their application fee for applying this teacher Vacancy. How to Select Candidates for these School Jobs? No you must be thinking about the selection process for these school jobs in India. So the RPSC department decided to select the candidates on the basis of entrance exam, that mean RPSC Recruitment department is going to conduct a written examination for the selection of the candidates. There is no Date yet in the advertisement for the written examination. 1. Paper-1 will contain maximum 200 marks. 2. There will be 2 Hr. Duration of question Paper. 3. Paper-1 will contain 100 Questions of Multiple Choice. 1. Maximum Marks for Paper-2 is 300 marks. 2. 2.00 Hours 30 Minutes Duration of the Exam. 3. 150 total multiple choices Questions. How to Apply Online for these School Jobs? This question is very common in every student mind who are wishing to apply for this RPSC Recruitment process. The answer is you have to apply online through the official website of RPSC department. But the link for applying these school jobs will be activated on 10th May 2018. The link for applying online will be expired on 9th of June 2018. So currently the link for applying online is not available yet. We will share the link below here when it will activate on 10th May. So visit us again or Book mark this page. 10TH MAY 2018 is the Start Date to apply. 9th June 2018 is the Last Date to apply.